Yacht charter cruise in Turkey is to take plenty of sunshine and mix them throughly with chrystal clear waters of the mediterranean in all colors of the green and blue from turquoise to emerald, put a little soft breeze, few shaded beaches with pine trees, add some lonely bays and some some rugged coastlines, stir them with exotic islands and generously add, lush green olives, figs and lemon trees. Yacht charter destinations in Turkey Then serve generously with bright blue skies, romantic sunsets and enchanting starry nights. How did you like it so far ? 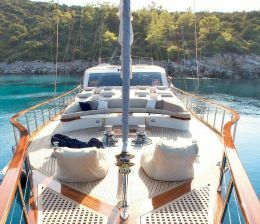 Well, if yes then how about a boat trip called “Yacht cruise in Turkey” on a wooden yacht called Turkish Gulet, which is completely custom made of special woods, blue cruise in turkey onboard gulets are the products of centuries old mediterranean boat building experience and the Yacht charter in Turkey is a journey full of surprises. Territorial waters between Charter Destinations Turkey and Greece are only 6 miles since most of the frontiers between near by greek islands such as Castellorizonte, Kos and many others are even closer than 1 nautical mile from Mainland Turkey. There are regular ferry services between Turkish ports and the greek islands such as Fethiye Marmaris/ Rhodos or Bodrum / Kos and Datca /Symi. Most of our guests prefer to see both cultures of Turkish and Greek with countless similarities however yet different cuisines, Music and the folkloric arts. even though very easy to access the greek islands yet there are two different countries and there are customs and immigration issues which takes time and the guests willing to go to greek islands needs a valid Schengen visa to be able to visit those islands. This is a privileged holiday away from the daily routine, more refreshing than any other holiday you have spent before. There is literally no better way to relax, to dream and feel what life is all about ! The taste of unlimited freedom in the middle of turquoise waters to be shared with your loved ones and friendly people around you, just feel the peace and joy! 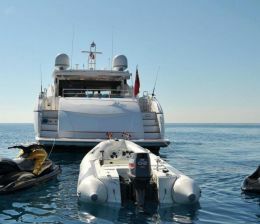 while you are resting in Yacht cruise in turkey a lot of goodies will be prepared for you. Since the Turkish cuisine is one of the best in the world, enjoy the delicious food and exotic flavors , At night, enjoy a glass of cappadocian wine or Turkish raki (lions milk) and let the unforgettable moments pass in review and spend some time with your loved ones, Show them that you have a real taste for romance and fantasy on board a Turkish gulet Turkey has become one of the most popular blue cruise in turkey destinations in the world, Because Turkey has so much to offer her visitors; Unique landscapes and natural wonders, Historical and archaeological sites, Travelling facilities, Good value prices, wide range of accommodation alternatives & must see destinations. Due to blue cruise in Turkey’s diverse geography, one can experience four different seasons in any one day. The summers are long lasting as long as eight months in some parts. The rectangular shaped country is surrounded by three different seas. 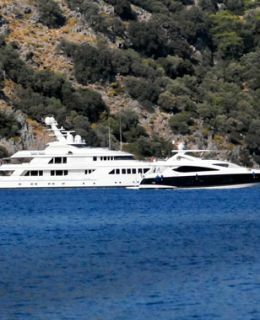 blue cruise in Turkey has awesome beaches, bays, straits and islands. blue cruise in Turkey is also embellished with great mountains, valleys, lakes, canyons and waterfalls perfect for winter and summer tourism and sports of all kind including; trekking, rafting, paragliding, balloon travelling, bird watching, hunting, mountain climbing, golfing, valley tourism, cave touring, scuba diving, boating and also suitable for youth and congress tourism. Turkey is a stupendous open-air museum and the cradle of different civilizations and home to different religions for centuries Health tourism has also developed as so many healing waters, hot springs and mud are highly recommended by the authorities as a remedy for many diseases.. Yacht Charter in Turkey. Turkey is an immense peninsula extending with an area of 814,578 km2 and connecting Asia to Europe through the Sea of Marmara and the Straits of Istanbul and Dardanelles. Anatolia is almost rectangular in lay out; 1500 km long and 500 km wide. Turkey has 300 natural and 130 artificial lakes. Turkey has different geographical formations including parallel mountains, extinct volcanoes, valleys splinted by ravines and plateaus. This geography leads to moderate climate in the Black Sea region, Mediterranean climate on the southern coast and arid climate in the central part and a harsh mountain climate in eastern side. Due to climate variations, the fauna and flora are some of the richest. The Aegean coastline is considered an important nursery ground for Mediterranean monk seals and turtles Caretta caretta. Dalyan Iztuzu Beache is the breeding ground of caretta carettas. Islam is the predominant religion with about 99% of the population. Turkey is a democratic, secular, unitary and constitutional republic rooted with cultural heritage. Turkey is the only secular state in Islamic world; welcoming and being home to different religions as well. There are 234 Churches and 24 Synagogues throughout the country. People wear modern dresses like any western countries, but dress coding in rural areas are more traditional style. Solar calendar is used in Turkey. Turkish is the sole official language throughout Turkey; also English is widely spoken in the touristic spots. Turkish Lira is the currency. Convertible hard currencies are accepted in most places. The local banks’ ATMs are abundant and work efficiently. Major credit cards are commonly accepted. Isolated coastal restaurants prefer cash, you should be prepared with Turkish currency when you are dining or shopping in more remote cruising areas. There are three GSM operators in Turkey, providing 3G services. Most places have a post office, where local and international calls can be made. Telephone cards can be purchased as well. In the post offices and hotels calls are metered and payment is made at the front desk. There is a roaming agreement between Turkish and Greek service providers—along the coast the signal is picked up by either country depending on proximity. Internet connections are available in the marinas. Most towns have Internet cafes. Facsimile connections from digital phones are available with the proper PC card for specific cellular phones. Bank Hours and public services (May vary in summer in resort areas) Monday to Friday 08:30 ­– 12:00 13:30 – 18:00 Weight and Measures : The metric system is used. Electricity : 220 volts all over Turkey. 380 volts available in most marinas. Time : GMT +2 in winter, and GMT +3 in summer (from the end of March to the end of October). Religious Feasts: ( Blue cruise in Turkey ) The dates of religious holidays come 10 days earlier each year according to Lunar calendar. Ramadan holy Days (Seker Bayrami) lasts 3 days and symbolizes the end of the Ramadan, which is a 30 day period of fasting. Holy Day of Sacrifice (Kurban Bayrami) follows 10 weeks after Seker Bayrami. The feast of the sacrifice lasts 4 days. Banks and public services are closed on religious feasts and national holidays.